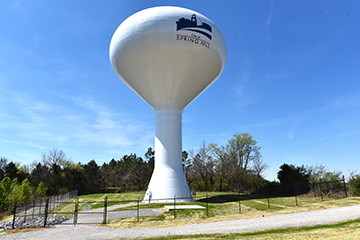 To meet our city's growing water needs, a new 1.5-million-gallon water tank was constructed, and went online in April 2016, behind the Hardins Landing neighborhood at the southern dead-end of Commonwealth Drive. The tank is helping with storage and capacity needs, and increasing water pressure. See a time-lapse video of the tank's construction.